Founded in 1895 and designed by Samuel “Mure” Fergusson, New Zealand Golf Club is a top-class course located within the famous Surrey heath belt. New Zealand was laid out on the estate of H.F. Locke-King, who also built Brooklands, the world’s first motor racing circuit, on his property. 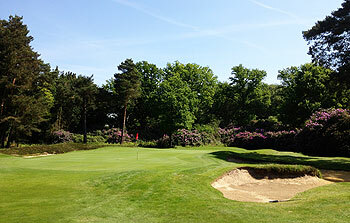 Following in the footsteps of nearby Woking Golf Club, New Zealand’s design was innovative, being one of the earliest courses to be routed across dense heathland. Fergusson continued to improve the layout for another thirty years during his long-term secretarial position at New Zealand Golf Club. In 1931, after Fergusson’s death, Tom Simpson (aided by Philip Mackenzie Ross) was commissioned to perform a major redesign of the course, which included significant bunker modifications. According to Bernard Darwin, "New Zealand is sui generis. It does not compete with other courses, but it sets its own standard and lives up to it. If anyone wants to play a friendly game, uncrowded and unseen, to have a good lunch in pleasant company, and get home early to London, there is no place like New Zealand." Not a long course by today’s standards, at a little over 6,000 yards, but with a lowly par of 68, it represents a challenge; six of the par fours are more than 400 yards long. Needless to say, accuracy rather than distance is important from the tee. The course plays through avenues of trees and there is plenty of heather to catch the wayward ball. New Zealand really is a stylish golf course and it’s a privilege to be able to play a round at this engaging golf club. Most of the holes are isolated from each other by the trees; it’s an intimate feeling and a great place to play golf with friends. The 9th hole is about as far away from the clubhouse as you can get and it's the first in a cluster of three holes which are located on the other side of Martyrs Lane – so make sure you have everything you need in your bag before you start your round. 24 of England's top 100 completed and a thoroughly enjoyable day. New Zealand is a lovely course. At first you look at the shortness, but as others have said you will need all your clubs. Good par 4s are what make this course and from the outset you need to hit long and importantly to the right place. In the main we used 3 woods off the tee but that means long irons and fairway woods were the order of the day. My favourite holes were 16 and 17 and on 17 make sure you take enough club to make the corner. The course is expensive if you are just a visitor but you are made to feel extremely welcome and conversation with a local who joined in 1980 who managed to play 2 holes on his first visit before his playing partner broke his wrist hitting out of the heather just highlights the importance of finding the fairway here. I would recommend the course to anyone looking for an enjoyable round. Great golf course in fabulous condition. Extremely short by today's standards, but that doesn't detract from the toughness of the course. There are quite a few par 4s, that feel very 'samey' (370yds with a bunker in the fairway, and dead straight), but the green complexes were simply sublime! As a golf club I found it extremely old fashioned and pretentious, poor communication from the club (lack of website/email) heavily impacted on my day as I was made to feel responsible for not knowing some of their policies - if you impose a jacket & tie rule (which I have no issues with at all) you should make people aware of it in advance, not expect them to know it. I have friend who really enjoys the yesteryear atmosphere of clubs like Brancaster, Luffness, Swinley Forest and Rye. Unfortunately, he could not join us at New Zealand. The changing room alone would have been worth the visit for him. Having said this, it should also be noted that New Zealand has a much more female-friendly atmosphere than most places of its kind. However, two other things made the day for me: 1) the club truly treats you like a member for the day. You play as much as you like, start whenever the tee is free, choose your tees as you wish and settle your bill at the end of the day. 2) they really get on with it on the course, but in the nicest way possible, not in the "we-are-members-and you-are-spoiling-our-fun" way that you can experience at Muirfield or Rye, if you are unlucky. We played after a society in the morning and got round in under four hours. Had to wait a little bit, but it gave us the time to enjoy the scenery and plan our way around the course on our first round. In the afternoon we played the almost deserted course at under three hours as a two-ball. New Zealand Golf Club is one of the least heralded golf courses on the Surrey sandbelt yet it is one of the most fascinating and maximises its relatively flat terrain to great effect. I suspect The Club are quite happy that their course often goes under the radar and certainly doesn’t seek the attention that others crave. The course has a reputation of being short and tricky and many people will look at the scorecard and see a yardage of just 5,947 and believe this myth. The course isn’t long by any stretch of the imagination but with a par of just 68 it certainly doesn’t play as short as it may initially appear. Indeed you are as likely to use every club in the bag here as anywhere. The opening two holes, par fours of well over 400 yards, are a stern introduction to this highly strategic and visually deceiving course. The five par-threes have an average length of 170-yards and that includes the 120-yard 10th; you are likely to be hitting mid and long irons into these well defended one-shotters. There is just one par-five too and the presence of heather lining every fairway ensures that New Zealand is no pushover. A SSS of 69 is testament to that. Unlike at Swinley Forest, The Berkshire, Sunningdale and some other neighbouring courses there are no real jaw-dropping holes at New Zealand but there are 18 good-to-excellent ones that ooze subtlety, deception and strategy. New Zealand is undoubtedly a course for all the ages too. It would be a fantastic place to learn your game and with no disrespect to the elder generation I could easily envisage myself, health and wealth permitting, pottering around here during my twilight years. Was able to obtain a round at the New Zealand with a phone call an hour before the tee time. Club very hospitable and playing as a 1 ball was able to skate round in 2 hours 15 minutes, thanks to some friendly and accommodating members. A very good golf course but just a touch below the 3Ws, although it is marginal. The par of 68 is tough with just the one par 5. As a consequence, naturally, there is less variety to the course with 10 or so par 4s all of similar length. I absolutely recognise that there is a lack of land, as with most older inland courses, that prohibit converting a couple of the par 4s into par 5s. Very good variety of par 3s, with the 16th the toughest. The first is understated but a top start to the round, mixing length with width off the tee. The 2nd is the toughest hole on the course, being both long and narrow. In my view, the stretch of holes from 7 to 12 are the strength of the course. Have to admit that I am not keen on 17 and 18 which are a little too “parkland” for my taste. A spot just outside the top 100 is about right. Very much worth a play though. Having played with a New Zealand member at a nearby club, I hoped for a possible invite to play there. He asked me to play the following day and I dropped all prior arrangements! This is without doubt as enjoyable a days golf as it is possible to have on all fronts. The course is fantastic and in super condition and very playable. The Heather lined fairways are a little softer than some of the other courses on the Surrey sand belt and the greens are true with subtle breaks. There are little loops to make up shorter rounds of 9 and 12 holes and is great for a quick knock in the morning before Lunch! Lunch is an event with 4 courses, copious amounts of wine including a great Carvery which has to be sampled to be believed before setting you u for an 18 hole round afterwards. Stand out holes would be 1,2,9,15 and 17 and should you walk off with par on them you will be very happy. Best par 3 would be 16, not that I played it well. Enjoy the day if you are lucky enough to play here it is a privelege and brilliant experience! Fantastic course, a real feeling of stepping back in time, to simple pleasures, would thoroughly recommend a 36 hole visit with lunch between, an easy walking course, deceptively long, with penal heather either side of tight cambered fairways, which only the straightest of hits will find. A joy to play ! Just the prettiest little course.Quintessentially English and perfect in almost every way.Play here - you won't be disappointed. Wonderful! From the moment I drove through the gates I knew this was my kind of golf course, traditional and simple. Do not be fooled by the card saying less then 6000 yards, you need to remain focused to score well but if you are not playing well it does not matter as it will still be a great walk with lovely vistas. of all the reviews i read of the new zealand club jcb lay's of 05/2013 is the most succinct - a soon as you enter the gates of the club you step back in time - hugely friendly staff, excellent service and just about the right amount of attention that is so, but not fussy nor reminds you of a still collar. of the many times i have played the course as a guest of a member it has always been presented in absolutely exquisite condition and as a prior reviewer has commented the first and second holes are an excellent introduction to what is a very very fine golf course. the staff and the members should take pride that these are the reasons so many guests long to be invited back!